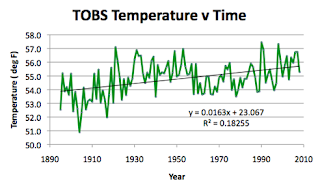 This is a continuation of the series where I look at the temperatures recorded for an individual state, over the past 115 years, and see what that data tells us. Moving on from West Virginia which I covered last, to Virginia returns me to the Atlantic coast, and a certain curiosity as to whether the significant drop in temperatures between 1948 and 1965, found in other states further South along the coast, also occurred here. (For the impatient, it does). 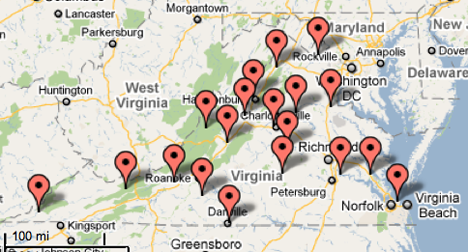 Virginia has 19 USHCN stations from Blacksburg to Woodstock, and has two GISS stations on the list, at Richmond and Roanoke. Unfortunately the CDIAC site still has the problems that I noted last week, when writing about West Virginia and it doesn’t appear possible at the moment to get the data directly from the site, which is an irritant. 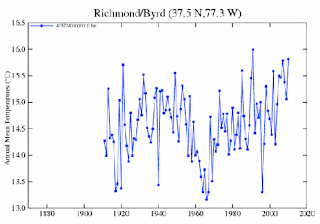 There are five Richmond sites as supplying data to GISS, though only one, Richmond Byrd, with the correct location, and it has data from 1911. 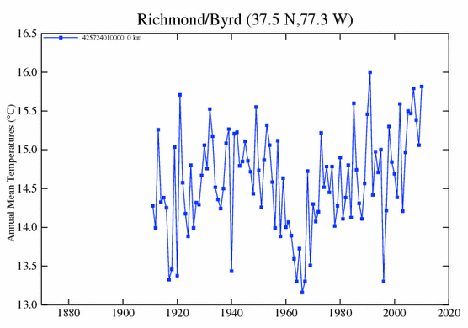 Richmond is relatively close to the coast, and shows the temperature drop I referred to above, reaching a high in 1949, then dropping to a low in 1966. UPDATE: Browsing Climate Audit, I came to Martin A's suggestion that we should consider the first difference trend for temperatures. I hadn't thought to do that, but since the data is easy to hand, I ran the plot and have added it to the end of the post. 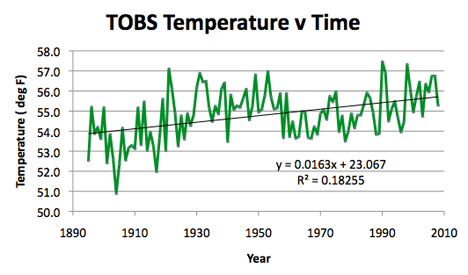 As Hu McCulloch noted, it doesn't seem to add much to the information on the state temperatures, having just about averaged out over the century. So, with respect, I don't think I'll add it to the repertoire. 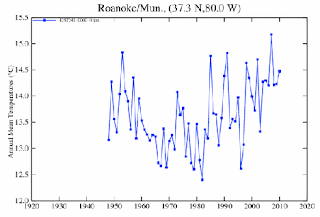 Annual temperatures as reported for the GISS station at Richmond, VA.
Roanoke is one of the westernmost stations in the set, and it only has data from 1948, so that although there is a fall in temperatures from the beginning, which bottoms out in 1982, information on the temperatures in the 30’s is missing. 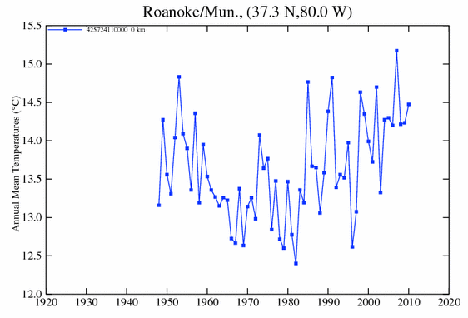 Annual temperatures as reported for the GISS station at Roanoke, VA. 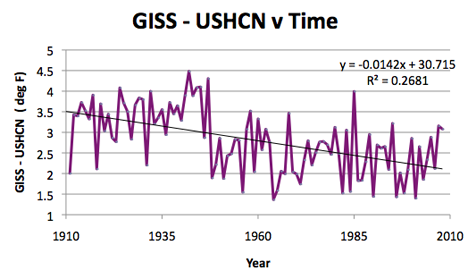 When I combine the temperatures for the state from the USHCN network, and compare this with the average for the two GISS stations, then I get a graph that shows the change in range of the two stations, but that, recognizing that impact, shows that the GISS stations have always shown a higher temperature (by about 2.8 deg F). Difference between GISS station average temperature and that of the USHCN average temperature per year. 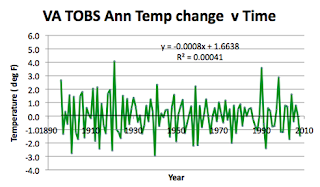 There is still that drop in temperature from around 1950 to about 1968, with a consequent pick-up in temperature. Obviously we are no longer in that group of states that lost temperature over the century. Virginia is 430 miles long and 200 miles wide. It runs from 75.22 deg W to 83.62 deg W, and from 36.52 deg N to 39.62 deg N. The central latitude is 37.49 deg N, that of the USHCN average is 37.7 deg N, and that of the GISS stations is 37.41 deg N.
The elevation in the state runs from sea-level to 1,742 m, with a mean elevation of 290 m. The average elevation of the USHCN stations is 281 m, and for the GISS stations 172 m.
It was a little more difficult to get the information on population for Virginia, since the site names did not easily fit with the source sites that I use. Bremo Bluff did not have a citi-data site, so I used the Zip-code site to find that it was 795. Burkes Garden was a little more of a challenge, with a population of 260 coming after a greater search, though it is 7 miles from Tazewell which has a population of 4,282. Dale Enterprise turns out to be on the outskirts of Harrisonburg (I had to use Google Earth to find that one) Hot Springs is (via Google Earth) actually now in Clifton Forge. Lincoln is near Purcellville, using the same approach; Piemont is in Orange, VA (via Google Earth) And so, ultimately it was possible to get some information on population sizes for all the stations around the state. 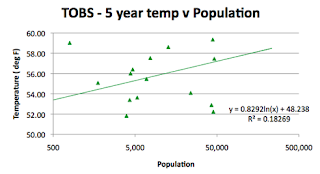 Looking therefore at the effects of geography and people on station data for Virginia. 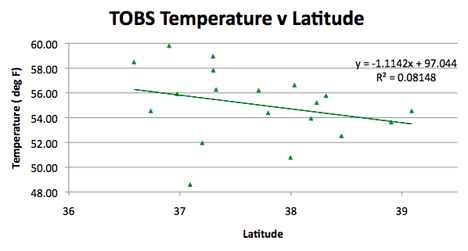 Average station temperature for Virginia as it compares with station latitude. The correlation is not as good as it normally is, and that may be because of the large variations in elevation within the state. That elevation also influences the apparent correlation with longitude, but remember that this regression line went up on the other side of the mountains in West Virginia. 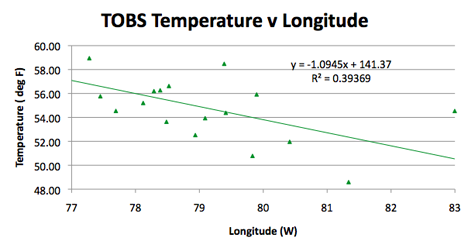 Average station temperature for Virginia as it compares with station longitude. 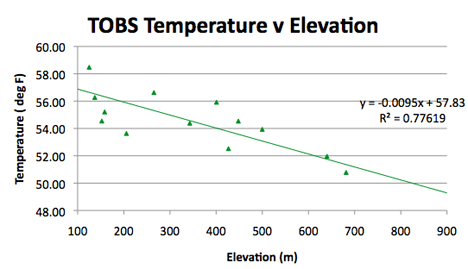 The regression coefficient is also much greater with elevation. 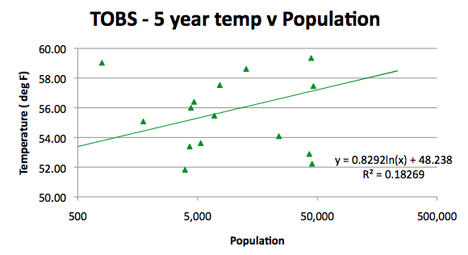 Average station temperature for Virginia as it compares with population near the station. 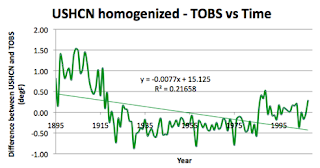 If one were to take out the temperatures pre 1915, the homogenized and TOBS data would have been relatively equivalent until just after 1980 when there is an increase in the homogenized average. UPDATE: Here is the finite difference plot, i.e. 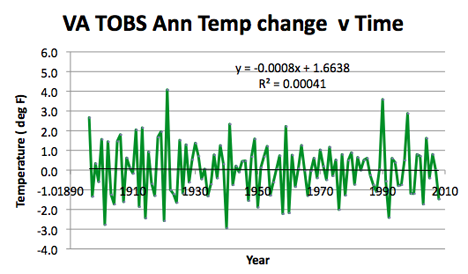 I have plotted the temperature change each year, by subtracting fromt hat annual average the temperature of the previous year, as a function of time. 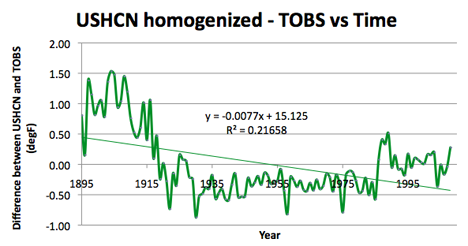 It is for the average of the USHCN TOBS data for the year, and it appears to suggest that, overall, the changes average out - which would suggest there hasn't been that much change in overall temperature, though the plots at the start of the post would suggest a rise of some 1.6 deg F per century. Change in average Virginia temperature from the previous year, as a function of time. As a Virginia resident and weather enthusiast, I've been looking for VA monthly combined temperature data. If this is something you have and are willing to share, please email me at stevengass1 [at symbol] a o l dot com . Thanks and Happy New Year! Katla, the volcano in Iceland, begins?